MU-MIMO (Multi-User Multiple-Input and Multiple-Output) is a set of communication technologies in which several users or wireless terminals communicate with each other via radio antennas. Unlike its predecessor, the SU-MIMO (Single-User Multiple-Input and Multiple Output) technology, which used more antennas to improve the range and quality of the signal at the potential cost of interfering with other devices, MU-MIMO goes beyond that and assigns a single, dedicated transmission signal to each compatible device in range. This way, each user will benefit from not having to compete over wireless resources. The technology will have a large impact in places like cafes, where a large number of users connect to a single wireless router. 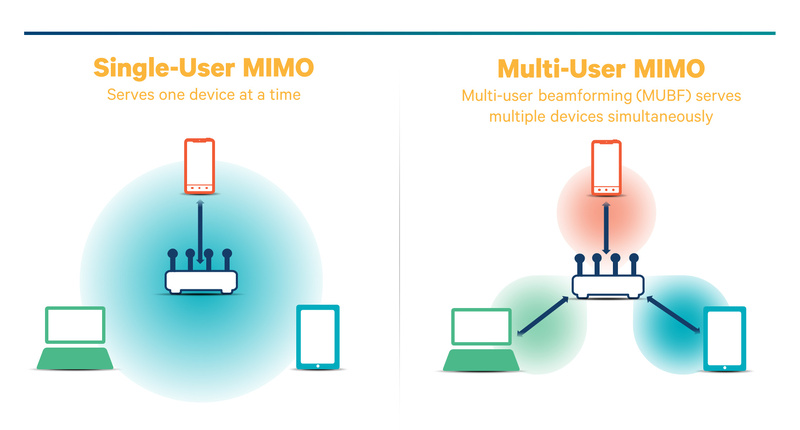 Using a MU-MIMO router will enable compatible devices to be served simultaneously, while freeing up bandwidth and reducing the number of non-compatible devices that must wait for their turn to use the wireless signal. It’s also useful in a home or office where there are multiple devices connected to a router (for instance a tablet, a laptop and two phones), providing much better access times, less interference and a better connection to the router. Activities such as video and audio streaming or online gaming will be significantly improved by this technology. The MU-MIMO technology is slowly being implemented within notebooks as well, such as select models from Acer’s E Series.